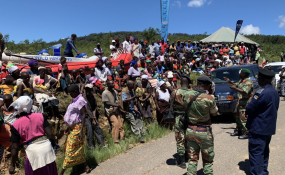 People in Chimanimani complain to senior army officials in charge of a temporary camp set up after Cyclone Idai that food is not reaching them. SOUTH Africa-based Zimbabwean pastor, Chenjerai Kangausaru, who is in the country to donate goods to Cyclone Idai victims, has urged Zimbabweans and Africa as a whole to unite in love for the continent to be prosperous. The cleric said this during an interview with Standard Style on Thursday. The Family of God pastor said he was deeply moved by the massive response from Zimbabweans from all walks of life, including students at his college, Sir Isaac Newton, which is in Johannesburg, who heeded his call to help the victims. "The borders of Africa must be broken as we are one people and Africa is my playground. I currently have business interests in Zimbabwe and South Africa," he said. "What touched me is that while I am also a Zanu PF politician, I have successfully mobilised Zimbabweans from all walks of life irrespective of their religious, political and social backgrounds to come together and assist our people in Chimanimani and Chipinge who have lost their loved ones, houses and livestock." Kangausaru said other similar initiatives by Zimbabweans in the aftermath of the cylone, had brought hope that the nation was capable of achieving much more when united. He added that his Christian background had inspired him to engage in many philantropic activities such as building a clinic in Hurungwe East in Karoi district, where he is a farmer. Meanwhile, a group of music ministers, comprising gospel musicians, managers, producers and other stakeholders, are mobilising support for Cyclone Idai victims. "As Zimbabwe gospel artistes, we have agreed to complement efforts of our colleagues who are organising a fundraising show on Sunday [today] aimed at helping victims of Cyclone Idai in Chipinge and Chimanimani," said one of the organisers, Munei Nyoni. "We have sought the assistance of our father, Pastor Charles Charamba, to receive our contributions that are running under the theme #Munhu wese $10." Pastor Charamba's EcoCash number is 0772 383 674. Nyoni said those with material donations should leave them at Mason Court, Suite 9, corner Second Street and Selous Avenue in Harare. The donations would be handed over in Chipinge and Chimanimani tomorrow.